Here are the top 100 defenders in college basketball based on calculations at www.valueaddbasketball.com as of December 29, 2018. These are the personal AdjD calculations, which tells you how much each player lowers his team's AdjD at www.kenpom.com. This system was developed in 2011 and explained in this post and has undergone only minor adjustments. This email went out to our sports list the morning of December 30. To be added to the list, email pudnerjohn@gmail.com with "add to sports list" in the subject field. Of the 4,095 college players to take the court this season, Dedric Lawson's ability to improve Kansas an average of 13.29 points per game on offense and defense makes him the most valuable player in the country - and here are the 20 most valuable listed at www.valueaddbasketball.com. Look for the CBS 247 story on the top 8 match-up between St. John's Shamorie Ponds and Marquette's Markus Howard, who just scored 62 points in a 29 minute stretch on 13 of 15 three-pointers and 13 of 13 free throws to shoot up the 6th. In addition to the CBS Sports 247 site, keep up with this blog for coverage of the Value Add Basketball rankings and Statis-Pro baseball projections all year. You can sort www.valueaddbasketball.com by team, conference or even click for past projections and seasons. Click here for the explanation of the Value Add basketball and how it calculates how much worse a teams average score would be if the player were replaced by a bench player on a mediocre team. The top 5 defensive players in the country, based on their personal AdjD points by which they lower their teams www.kenpom.com rating. This updates starts February 22, as actual MLB teams player there first Spring Training games. The following are the standings in the very balanced NL - unlike our 2018 Statis-Pro AL system where the players cards of the Astros, Red Sox, Yankees and Indians were so much better than the other 11 teams. Always click here for the player card on updated rosters, and here for the most current standings and a short summary of each game played to date. To play your own games, just click here and get the needed dice. In the rugged NL Central, the Cardinals have been the shockingly bad/unlucky team out, as they are rivaling the lowly Marlins for the worst team. The next games complete our effort to make sure all of the strongest hitting pitchers have batted, and also making sure every AL team has played at least one interleague game so that I am sure to have their projected cards set for anyone else who wants to use them by clicking here. G3 or G4 always advances runner from 2nd to 3rd. Click for how to play the basic game and ongoing season being played here. A roll of 18 or 19 is a possible error. If this occurs on a hit, then the outfielder the ball is hit to is the possible out. If the roll occurs on an OUT, then roll the two 6-sided dice again to determine which player might commit an error. Use the 20-sided die to determine if that player made an error. 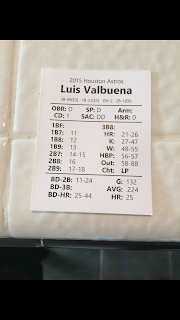 If the roll is equal to or lower than a players E rating then the player makes a 1-base error. 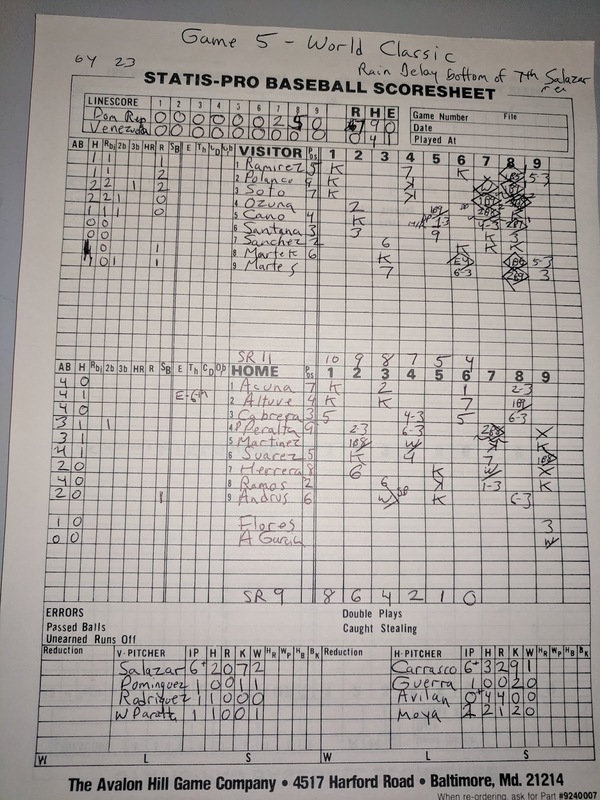 If the roll is 11 - 20, then subtract 10 and use the same rule as in the bullet above BUT if the number minus 10 is lower than the player's E rating then it is a two base error. If there is no error the fielder makes the play but all runners advance, either as a GA (grounder) or FD (deep flyout). A roll of 20 is a flyout to centerfield (F8) if noone is on base. 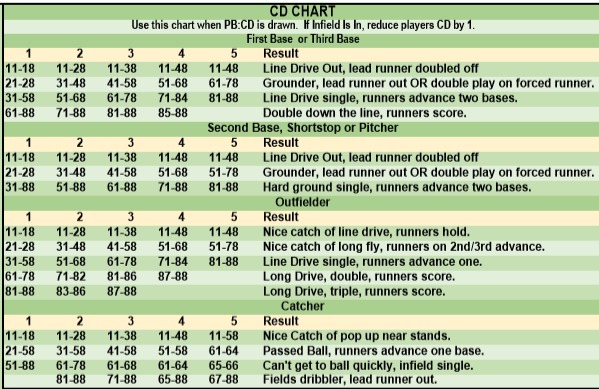 If anyone is on base, ignore the PB and instead use the two 6-sided dice to determine if the play is a clutch batting attempt for the (BD) on a 2 to 4, a clutch defensive play (CD) by one of the fielder is a 5 to 9 or an unusual play (Z) if 10 to 12. (see charts below). 1B (single) is turned into a bases-clearing double. 2B (double) is changed to a home run. 3B (triples) remains a triple. HR (home run (remains a home run. Walk or Hit by Pitch is a foul and roll again until the 11-88 random number is something besides a Walk or Hit by Pitch. Out or Strikeout remains and Out or Strikeout. The following is the CD chart to use, and it is just one of the many components you can order by clicking here to get a complete nice looking set from someone who produces incredible boards and cards that make the game play much easier. 10, 11 or 12 - Look up the result of the Random Number below for the result. Note, if the number is 81-88 you will need to get a new number to see who is injured on a play on the chart. 53-54: Difficult grounder, runners advance one base. E0 - E3 at 1B gets batter out, otherwise infield single. 55-56: Difficult grounder, runners advance one base. E0 - E3 at 2b gets batter out, otherwise infield single. 57-58: Difficult grounder, runners advance one base. E0 - E4 at SS gets batter out, otherwise infield single. 61-62: Difficult grounder, runners advance one base. E0 - E5 at 3b gets batter out, otherwise infield single. 63-66: Difficult fly ball in gap, E0 - E1 in LF makes catch for out and runners hold, otherwise double and all runners score. 67-72: Difficult fly ball in gap, E0 - E2 in CF makes catch for out and runners hold, otherwise double and all runners score. 73-76: Difficult fly ball in gap, E0 - E2 in RF makes catch for out and runners hold, otherwise double and all runners score. 77: Difficult foul pop, E0 - E2 at C makes catch for out and runners hold, otherwise foul. 78: TRIPLE PLAY POSSIBLE. Line out to SS if men on 1st and 2nd, to 3B if 1st and 3rd, 2b if 2nd and 3rd, and P if bases loaded. Get new PB number and if 2-6 then triple play, but if new PB is 7-12 then only double play with lead runner doubled off. 81-88: Get a new Random number to see who is injured and hte play on the chart below. 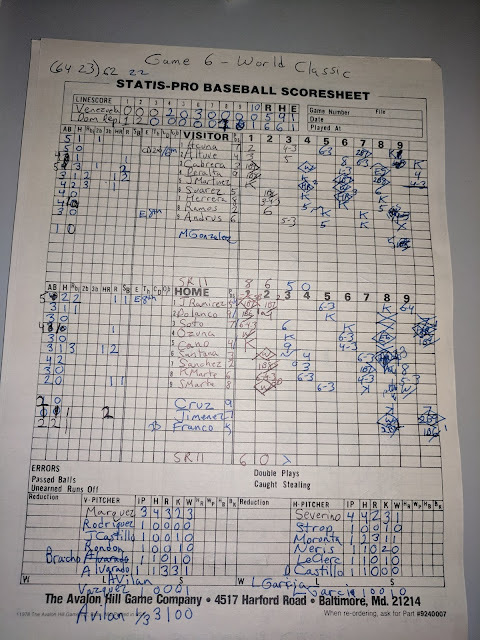 If you have the Statis-Pro Out Charts a roll of the 20-sided die can be used to get the result based on if the batter is a RP (right power), RN (right normal), LP (left power), LN (left normal) or P (pitcher batting). 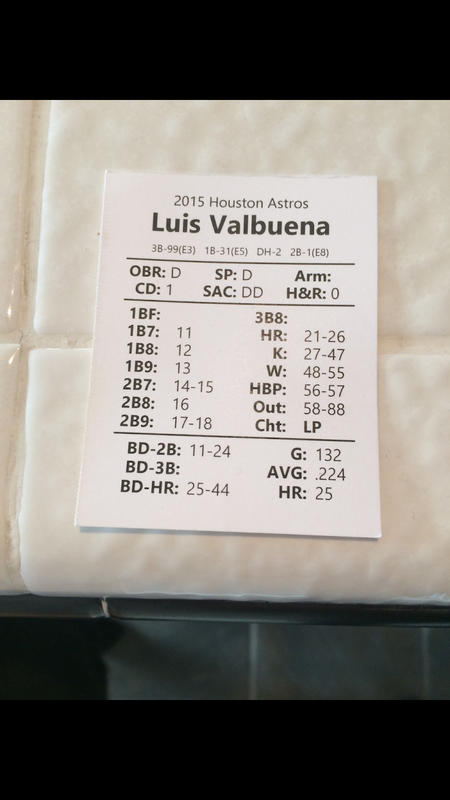 If a SP or SN is batting then use the RP or RN against left handed pitcher (LHP) or otherwise use LP or LN. The number indicates the position, but "inf" indicates it can be to any infield position, and roll a 6-sided die for the position with 1=pitcher, 2=catcher, 3=1st base, 4=2nd baseman, 5=3rd baseman, 6=shortstop. FD indicates a deep drive, and an OBR A-C scores from third, and OBR A or B goes from 2nd to 3rd. F indicates a flyout out. an "A" at the end of the result indicates the batter is out but all runners advance. an "X" in the middle of the result indicates runners hold and the lead runner who is forced is out. Even today, I carry the 5 dice with me to make the basic game my "travel" version, but play with the whole game setup when I'm at home. While I provide this game and all the players' cards for free here, we recommend purchasing a full Statis-Pro game from someone who produces all the components along with teams from throughout history. We provide these charts partly so that you can try the Advanced Rules before getting the game from them, but also because the only items that is hard to use based on the PDF they would send you is the Fast Action Deck - so this entire blog makes it possible to play the entire game with the dice as photographed instead of the Fast Action Deck. Click here for Games 1 through 4 of the Best of Seven Statis-Pro World Championship between Venezuela and the Regular season champion Dominican Republic. Click here for the regular season run down and season MVPs (top 10) and Cy Young (top 5). Learn to play Statis-Pro Baseball in 5 minutes by clicking here. 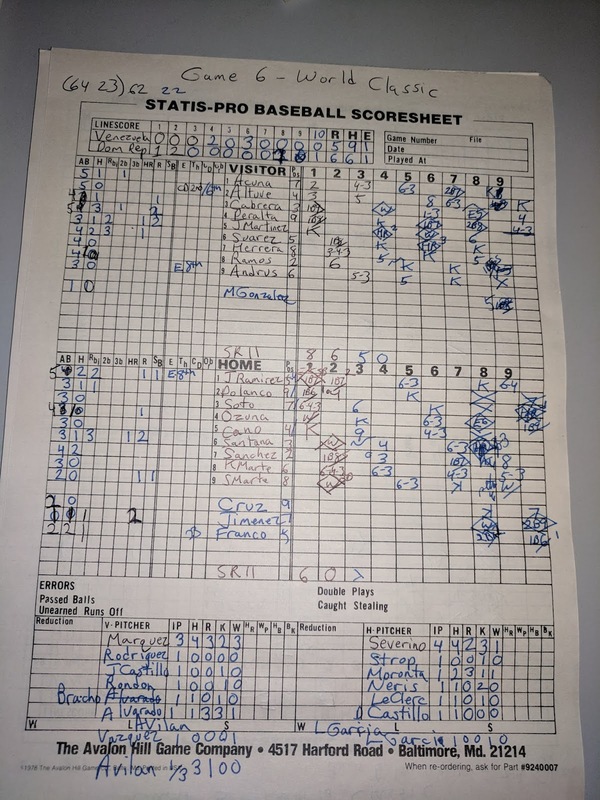 Below we will fill in the game-by-game account and scoresheets of Games 5, 6 and if necessary 7 to determine the best team in the world..
After six scoreless innings, each team had one hit apiece and Statis-Pro Cy Young Award winner Danny Salazar had lowered his ERA to 0.64 with two runs allowed in 28 innings in which he struck out 31, while Cy Young runner up Carlos Carrasco had an 0.91 ERA through 29 2/3 innings during which he allowed three runs and struck out 33. The incredible Dominican Republic line-up finally broke the dam in the top of the 7th against Carrasco, when Polanco walked, Soto singled, and then Ozuna delivered the all-time clutch double to clear the bases and chase Carrasco with the score 2-0. With Carrasco gone and a couple of relievers resting from performances in Game 4 that tied the series, the Dominican Republic feasted with eight hits in the 7th and 8th innings alone to win going away 7-0 and take a 3-2 series lead. Carrasco finished with a 1.51 ERA due to the two runs. Statis-Pro International MVP Jose Ramirez singled in each of the first two innings, scoring once then driving in two more to take Venezuela to the brink of elimination in the best of seven. Only Jose Altuve's clutch diving catch ended the second inning with the Dominican Republic leading 3-0. Venezuela rallied with a Jose Martinez blasted a 2-run homer and Eugenio Suarez followed with a clutch 3-run homer in the sixth to give Venezuela a 5-3 lead. Another great defensive play by Altuve ended the bottom of the 6th. Both teams committed surprising errorsin the 8th. Gold glover Ramirez bobbled a grounder and David Peralta doubled to give Venezuela the chance to break the game wide open in the top of the eighth, Jose LeClerc induced two infield pop ups and registered a strike out to hold Venezuela to the 5-3 lead. After two strikeouts and a walk in the bottom of the 8th, Venezuelan shortstop bobbled a potential inning ending ground out. Pinch hitter Maikel Franco then ripped a double on a random number of "23," which I mistakenly thought was a homer at first because I was looking at Carlos Santana's card. Marcel Ozuna scored to tie the game 5-5. In the 10th inning, Franco was the hero again, grounding a one-out single through a drawn in infield to score Eloy Jimenez and end the championship series with a 6-5 Dominican Republic win. Not needed. The Dominican Republic won the series 4 games to 2 against Venezuela, which also came in 2nd in the round robin regular season with a 16-14 record (5 games behind the Dominican Republic's 21-9 record. The Dominican Republic ran away with the regular season to claim the World Pennant by scoring twice as many runs as they allowed, making the real competition to see who would finish second to play them in a series. 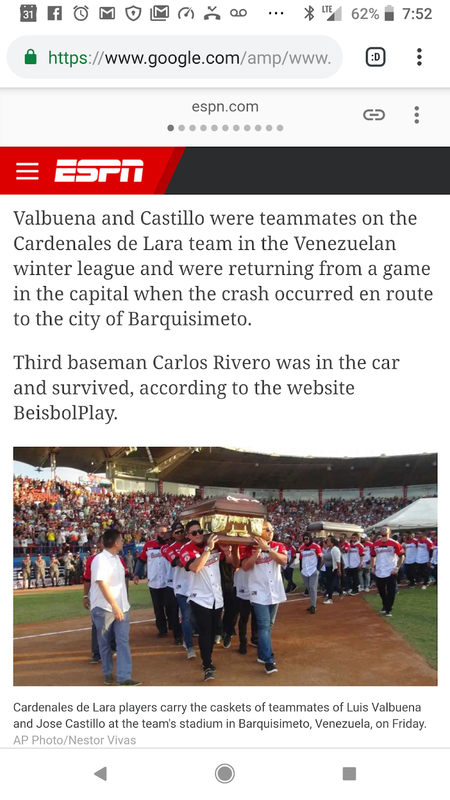 While Canada and Cuba finished 5th and 6th, they had the most exciting batter (Canadian Vlad Guerrero Jr.) and pitcher (Cuba's Chapman allowed only an Altuve single in 20 batters faced). . Venezuela finally took second when they beat Cuba and Japan eliminated Puerto Rico in the final game of the season. The blogs on the regular Statis-Pro season as well as the real-life tragedy of the real-life deaths of Venezuela has all been moved to this blog. The players who did the best in the Statis-Pro season are noted below as our "Cy Young" and "MVP" Award Winners based just on the 10-game round robin - where anything can happen. We did put weight on three incredible fielders to put them at the top of the list. Below are accounts of the regular season. 1. Venezuela entered 11-13 but beat Cuba 8-2 (counts as a 3 game sweep because 5+ run win margin) to go to 14-13, then 3-0 in game 2 to make their final record 16-14 in the round robin, and then had to wait to see if Puerto Rico would catch then for the last playoff spot. 2. If Canada wins both games over the Dominican Republic by at least 5 runs then they go to the playoffs with a 17-13 record the Dominican Republic is eliminated. In any of the other scenarios the Dominican Republic is in the playoff and will face either Puerto Rico or Venezuela. (Paxton and Taillon vs Salazar and Severino) UPDATE: After 4 inning scoreless pitching duel between Canadian Paxton (who just went from the Mariners to the Yankees) and Salazar for the Dominion Republic, K Marte singled in the 5th and 10 of the next 17 Dominican Republic batters scored to make it 10-0 after six innings en route to a 12-3 sweep. Ramirez stroked a 2-out, 8th inning homer in the second game with Jansen ready to come in if anyone reached base, giving the Dominican Republic a 6-5 win that capped a dominant 21-9 final record to win the division by 5 games while doubling their opponents scoring 6.2 - 3.1 runs per game. 3. If Puerto Rico finishes 3-3 or better vs Japan, or if they finish 2-4 but hold Japan to 5 or fewer total runs then they are the other playoff team. If not, then Venezuela is the other playoff team. (Berrios and J Lopez vs Ohtani and Darvish). UPDATE: Ohtani almost single-handedly eliminated Puerto Rico with a complete game 1-hitter in a 4-0 win, then scored 3 runs in a 9-2 finale to credit Japan with a 5-1 record for the series, and leave them tied with Puerto Rico at 15-15, clinching the playoffs for 16-14 Venezuela. The following are the records in the round robin of international All-Star teams being played via Statis-Pro Baseball. 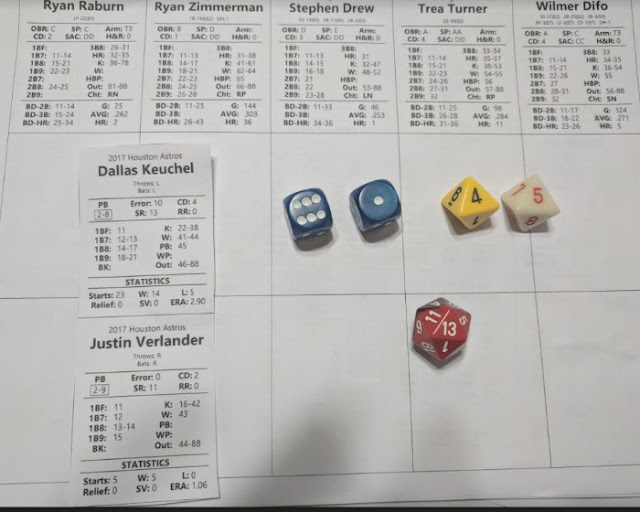 The 2019 Statis-Pro baseball cards can be sorted by MLB team and used to play the free Statis-Pro baseball game, however in the off season we sorted by birth place and picked all-stars from each region. Learn to play Statis-Pro Baseball in 5 minutes by clicking here. Here is each team's Game Log against each opponent. 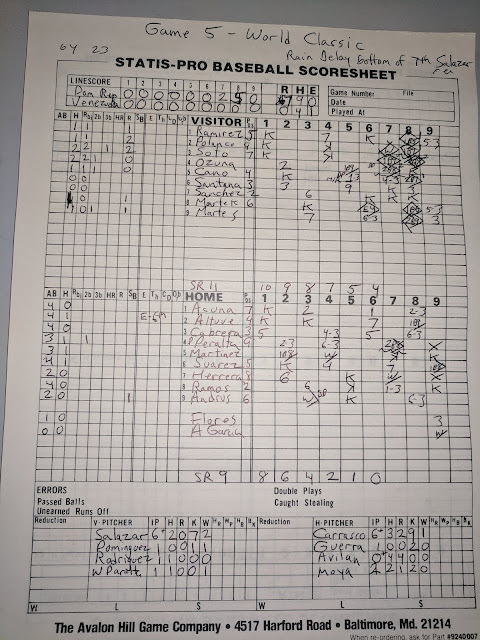 The team is listed, then which pitcher started for them, how many runs they score, if they were awarded 0, 1, 2 or 3 WINS for the game, the opponents pitcher, runs allowed, and how many losses they were awarded for the game. For example, Canada beat Cub 4-3 and gets credit for winning a "series" 2 games to 1. They lost to Cub 2-4 and are credited with losing that "series" 1-2. They beat Japan 11-2 and because that was by at least a 5-run margin it counts as a 3 games to none sweep in that series. Canada Paxson 11 3 Japan Darvish 2 0 Darvish 0 IP 9R, Paxson 9 IP 2R. Canada Soroko 3 2 Japan Ohtani 0 1 Gregorius homers twice, Soroko threw Jansen combine for shutout. Canada Soroko 2 1 Puerto Rico Cotton 5 2 Soroko and Cotton battled to 1-1 pitchers duel into the 7th before Puerto Rico beat up on Canada's pen. Cuba E Ramirez 4 0 Dom Republic C Martinez 12 3 Polanco, Soto and Santana all homered in 7-run 3rd, then Polanco hit another one in 5th. Cuba Elias 4 2 Puerto Rico Cotton 2 1 Chapman perfect out of pen to strand runners for win. Dom Republic C Martinez 12 3 Cuba E Ramirez 4 0 Polanco, Soto and Santana all homered in 7-run 3rd, then Polanco hit another one in 5th. Dom Republic L Castillo 12 3 Japan Ryu 2 0 Franco (2 HR, 3 of 4) led an 18-hit attack as DR batted .490 with an OPS of 1.908 during the last 11 innings of the series. Dom Republic L Castillo 5 2 Puerto Rico Teheran 2 1 L Castillo took a shutout into the 8th, an Cano and Santana combined for back-to-back hits 3 times including a triple and homer in the 6th. Dom Republic Severino 3 2 Puerto Rico J Lopez 2 1 One Cleveland Indian for each team, Lindor and Ramirez, homered as well as a single-steal-score inning, and Ozuna's 9th inning 2 out homer off Diaz led to the 13 inning win. Dom Republic Martinez 0 1 Venezuela Senzatela 4 2 Senzatela allowed just 3 singles and a walk in 8.2 innings before Vizciano wrapped up shutout. Acuna 3 of 5 with homer and double. Japan Darvish 2 0 Canada Paxson 11 3 Darvish 0 IP 9R, Paxson 9 IP 2R. Japan Ohtani 0 1 Canada Soroko 3 2 Gregorius homers twice, Soroko threw Jansen combine for shutout. Japan Ryu 2 0 Dom Republic L Castillo 12 3 Franco (2 HR, 3 of 4) led an 18-hit attack as DR batted .490 with an OPS of 1.908 during the last 11 innings of the series. Puerto Rico Cotton 5 2 Canada Soroko 2 1 Soroko and Cotton battled to 1-1 pitchers duel into the 7th before Puerto Rico beat up on Canada's pen. Puerto Rico Cotton 2 1 Cuba Elias 4 2 Chapman perfect out of pen to strand runners for win. Puerto Rico J Lopez 2 1 Dom Republic Severino 3 2 One Cleveland Indian for each team, Lindor and Ramirez, homered as well as a single-steal-score inning, and Ozuna's 9th inning 2 out homer off Diaz led to the 13 inning win. Puerto Rico Teheran 2 1 Dom Republic L Castillo 5 2 L Castillo took a shutout into the 8th, an Cano and Santana combined for back-to-back hits 3 times including a triple and homer in the 6th. Puerto Rico J Lopez 4 2 Venezuela Carrasco 1 1 PR greated Rondon with triple, single, homer by E Hernandez, Baez and Rosario to break up 1-1 pitchers duel in the 6th. Venezuela Senzatela 4 2 Dom Republic Martinez 0 1 Senzatela allowed just 3 singles and a walk in 8.2 innings before Vizciano wrapped up shutout. Acuna 3 of 5 with homer and double. Venezuela Carrasco 1 1 Puerto Rico J Lopez 4 2 PR greated Rondon with triple, single, homer by E Hernandez, Baez and Rosario to break up 1-1 pitchers duel in the 6th. We decided to use these rules to fairly distribute the number of innings each pitcher on the staff can pitch. (as noted above, if a team wins a series by at least 5 runs without going extra innings they are credited with a 3-game sweep, but otherwise a 2 game to 1.) All match-ups are two game series. Starting pitchers. In each two-game series, each team pitches either ace and 4th best starter OR 2nd and 3rd best starter to avoid one team having their 3rd and 4th pitcher face the 1st and 2nd best pitcher from another team. If SR runs out for pitcher he can finish inning with no reduction. Through the 6th inning he can pitch one more inning with a PB reduced by 1. Relievers pitch 1 inning every 2-game series with following and can also finish inning if RR runs out BUT with relievers reduce PB by 1 as soon as RR hits 0. If reliever comes in during an inning they can EITHER finish the inning OR go into the next inning with a PB reduced by 1 for that inning BUT in that case they must come out after 4 total batters faced. To keep from running out of pitchers, we never reduce a pitcher below a PB2-5, and if a team trails by at least 5 runs they can leave their worst remaining pitcher in as long as they want, but pitching as a PB: 2-5. Every team can pitch an unlimited number of innings with the "Extra Pitcher" and his PB2-5 line.